Boy, what is the easiest way to wash dishes when you are camping? Well, if you are camping in a camper or at a campground, the issue of washing dishes is different than if you are out in the backcountry. But regardless of which environment you have to be camping in, this new product can make cleaning up after the meal easy as one, two, three. The Folding Double Wash Basin by Coleman addresses the proper way one should clean dishes. It has two compartments that are made of heavy-duty plastic. The frame of this portable sink is made up of PVC material. It also has three handles that make dumping the waste water easy. 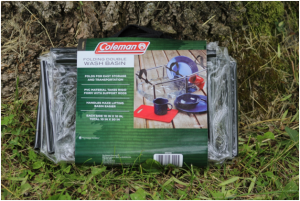 As I stated before, the Folding Double Wash Basin by Coleman makes cleaning dishes the proper way easy but what is the proper way. The first step in this process is to heat water up. If you are camping at a campground, you may find the hot water there hot enough but it is always a good idea to heat your own. Once the water is hot you can either leave it in the container or pour it into a separate basin. In this case, it will be the first compartment of the portable sink. The second “sink” will be used as a rinse but not just a rinse. To maximize your germ killing ability while you are camping, make sure to add a little bleach or white vinegar. Both of these substances are anti-bacterial and in doing so will kill any germs remaining. Once the dishes are rinsed, allow them to air-dry or wipe down with a clean towel and put away. After the dishes are done, dispose of the water properly. At a campground, that means down the wastewater system. If you are out in the backcountry, you may be required to bury it. While the directions above are just a guide in proper dish washing when you are camping, I have found that many campground campers use “dish pans” to do their dishes, which are impractical for backcountry camping. This is where the Folding Double Wash Basin by Coleman comes into play. This product is very compact and when opened creates two “sinks” that are 10 by 10 inches. It is very sturdy even through a long line of pots and pans. Once the task is done, this “portable sink” is easy to wash out and hang up to dry. After it has dried, it is just as easy to fold back up for storage but……the only negative I have for this product are the handles. The first time I used this camp sink and lifted the sink up to dump it, it folded in half and water went everywhere. The handles themselves do not seem to be able to hold the weight of a lot of water in the “sinks.” Having said that, I have found that if you utilize two people to dump the “sinks” the problem with the handles resolves itself.